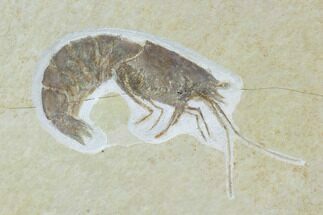 This is an very nicely preserved fossil shrimp (Aeger tipularius) from the 155 million year old Solnhofen Limestone of Germany. Not including the long antennae it's 3.4" long and would be over 4" if the tail wasn't tucked. 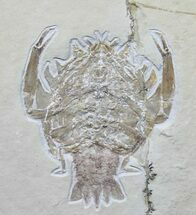 The Solnhofen limestones is a famous Lagerstätte in Germany that offer amazing preservation of Upper Jurassic fossils. 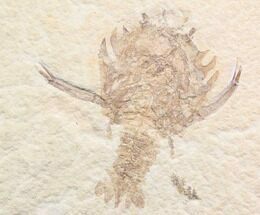 It is where on of the most famous fossils of all time, Archaeopteryx was found. 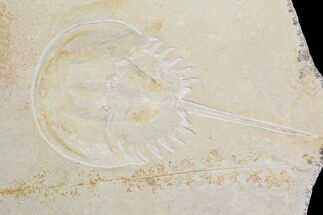 The fine grained limestone makes excellent building materials which has let to heavy quarrying over the past two centuries which as a result has led to some amazing fossils being unearthed. This area represented an archipelago at the edge of a sea. 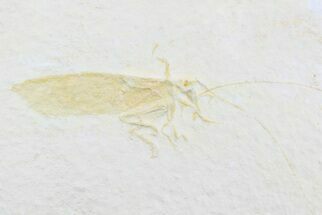 Due to high salt content, the lowest levels in the water column could not support much life and was devoid of oxygen. 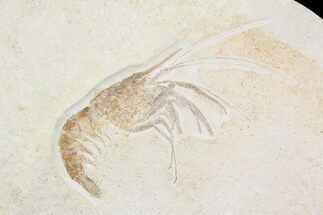 This lack of scavengers on the bottom of the sea led to amazing preservation of the fauna found there.